One of the best ways to protect your oral health is to perform oral hygiene on a regular basis. But, is brushing alone sufficient for cleaning your teeth? Your dentist explains why flossing is such an important preventive measure, and you’ll learn about the dangers of prolonged bacteria growth. Bacteria are always present in your mouth. Then, when you eat or drink anything other than water, if there are any leftover particles, they can attract even more microorganisms. Untreated, the latter can lead to tooth and gum decay. The most common form of oral hygiene is toothbrushing. The back-and-forth motion helps to agitate debris on the teeth, tongue and cheeks so they can be easily removed with a rinse. There is a downside to only using a toothbrush, though. It can only clean around 60% of the surface of your teeth. To get a more thorough cleaning, dental floss is required. What Makes Flossing So Important? The flexible nature of floss allows it to maneuver into the tight spaces between teeth. As it’s gently moved back-and-forth, it frees bacteria and debris that could otherwise contribute to advanced tooth and gum decay. 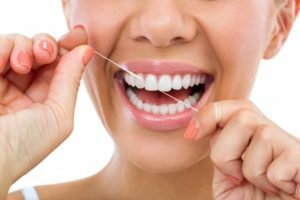 The thorough cleaning that flossing provides also helps to prevent the development of periodontal disease, which is the inflammation and eventual deterioration of the gums. Bacteria growth that goes unaddressed can also contribute to the development of Alzheimer’s disease, pancreatic cancer, heart disease, stroke and oral cancer. If you struggle with using traditional floss, you don’t have to go without the benefits. Instead, you can try the water flossing (Waterpik) option, which uses pulsating water to expel bacteria from the gum pockets. In addition to committing to flossing twice a day, you should also be sure to visit your local dentist for preventive care every six months. This serves as the perfect compliment to your oral hygiene by clearing away any stubborn plaque or tartar that may be lingering. Along with having your teeth cleaned, you’ll receive a full examination that will identify any existing issues, so the proper treatment plan can be initiated. So to experience the maximum in dental cleanliness and oral health, make flossing a regular part of your routine, and reach out to schedule a preventive care visit today! Dr. Brian Lee is a graduate of The University of Michigan School of Dentistry. After completing his general practice residency, he went on to open a state-of-the-art facility, where he has been providing top-notch care for over a decade. Dr. Lee helps patients maintain healthy teeth and gums at Dentistry at Hickory Flat, and he can be reached for more information through his website.